Flea and tick season has arrived. Are you prepared to prevent them from invading your pet, lawn and home? You may not even see them, but they could be hiding inside and outside. Fleas and ticks like to hide on pets, other animals, plants where other infested animals visit and even in your carpet, sofa and floors inside your home. Don’t panic. That is why you apply Frontline Plus to your pets to KILL flea and tick adults, eggs and larvae Frontline Plus destroys those pesky pets for one month. Frontline Plus breaks the flea life cycle and prevents infestation on your pet and home. Don’t underestimate these pesky pests. View their life cycle on Frontline.com. Stop them from reproducing TODAY with Frontline Plus. Click here to identify the common types of ticks in your area. Do you know how to apply Frontline Plus? Learn Here. Ask you vet about Frontline Plus. 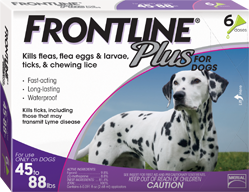 Stop by Lochte Feed & General Store to pick up Frontline Plus and other pet supplies! This entry was posted on Monday, April 22nd, 2013 at 2:29 pm	and is filed under News & Updates. You can follow any responses to this entry through the RSS 2.0 feed. Both comments and pings are currently closed.